Measure out semolina and flour onto a clean working surface. Form a hollow in the middle and add eggs. Whisk eggs with a fork and incorporate flour little by little, then knead to combine. If needed, add some water. Knead dough for approx. 10 min., wrap in plastic wrap, and let rest for approx. 30 min. In the meantime, add potatoes to a large pot and cover with water, then season with salt. Cook for approx. 20 min., or until fork-tender. In the meantime, brown butter in a small pot and let cool down. Slice mint into thin ribbons. Drain potatoes, add to a bowl, and mash with a fork. Add grated Parmesan cheese, browned butter, salt, pepper, mint, and stir to combine. Quarter pasta dough and use a pasta machine to roll out the dough. Stamp out discs of dough for the ravioli with a round cookie cutter. Add a spoonful of potato and mint filling to one disc and brush the dough with some water. Place a second disc of dough on top and press around the edges to seal. Repeat the process with remaining dough and filling. Bring a large pot water to a boil, salt well, and cook ravioli for approx. 5 min. In the meantime, melt butter in a large frying pan and add sage leaves and a ladle of cooking water from the ravioli. Add ravioli to the frying pan and toss to coat. 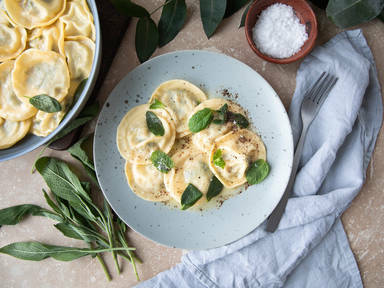 Serve ravioli with fresh mint and black pepper. Enjoy!